Fudge hearts are beautiful hearts made of rich chocolate fudge and dipped in a smooth layer of fondant. These make a great Valentine’s day candy gift for friends, family, and loved ones. I like to decorate mine with sprinkles, but you can also use writing icing to add personalized messages. You can use purchased or homemade fondant to coat the fudge. This recipe yields about 48 small (1 1/4-inch) hearts. Prepare a 9-by-13-inch pan by lining it with aluminum foil and spraying the foil with nonstick cooking spray. Place the chocolate chips, condensed milk, and salt in a large microwave-safe bowl. Microwave until melted, stirring after every 45 seconds to prevent overheating. Stir until the mixture is melted, smooth, and entirely free of lumps. Add the red hot candies or any other additives of your choosing, and the vanilla extract, and stir until well-combined. Scrape the mixture into the prepared pan and smooth into a thin, even layer. Allow the fudge to set for two hours in the refrigerator, or overnight at room temperature. Once set, lift the fudge from the pan using the foil as handles. Take your heart-shaped cutter and cut hearts from the fudge, placing them on a foil-lined baking sheet. Once you have cut out all the hearts you can, you will be left with a lot of fudge scraps. You can set them aside for nibbling, or if your fudge has warmed up a bit at room temperature, you can knead it together briefly. Re-roll it into a thin layer and cut additional hearts from the fudge. Using a 1 1/4-inch heart cutter, you can get about 48 hearts from this recipe, assuming you re-roll the fudge one or two times. Place the fudge hearts in the refrigerator to chill while you prepare the fondant. Cut the fondant into small chunks and place it in a double boiler on top of a pot of simmering water. If you don’t have a double boiler, place it in a heat-safe bowl that fits snugly over the top of a saucepan. Stir the fondant constantly while it melts. Different fondants have very different melting textures. Some fondants will melt right away and not require any additional water to get a liquid consistency, while others will require 1/2 cup or more to get very smooth. If your fondant is not melting smoothly, add a tablespoon of hot water and stir. Continue to add the water very slowly, stirring well after each addition, adding as little water as possible to get the fondant to a good dipping consistency. It should be fluid enough to easily coat the fudge, but thick enough that it leaves an opaque layer. If desired, stir in a few drops of the flavored extract of your choice. Once your fondant is melted and smooth, remove the double boiler from the heat, but leave the fondant bowl on top of the warm water. Cover a baking sheet with aluminum foil, and dust the foil with a thin, even layer of powdered sugar. 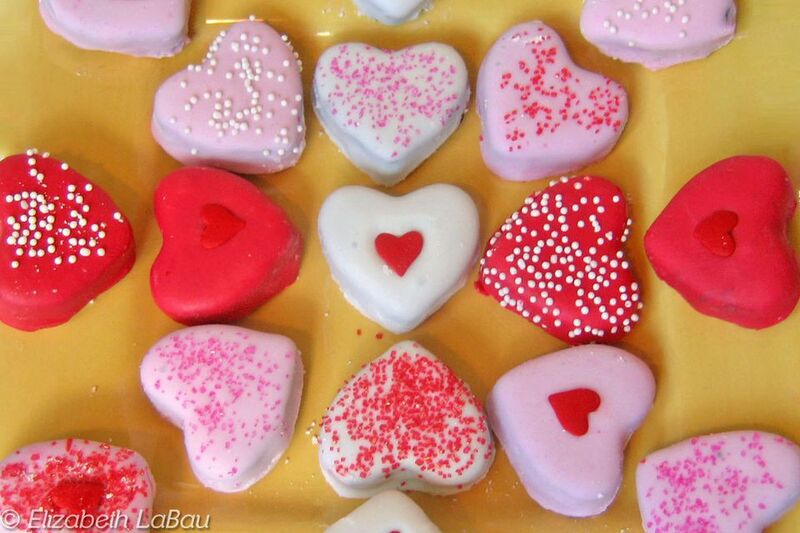 Take the fudge hearts from the refrigerator and, using a fork or dipping tools, dip one in the melted fondant. Remove it from the fondant and allow ​the excess fondant to drip back into the bowl. Place the dipped heart on the powdered sugar-dusted baking sheet--this will allow for easier removal later. While the fondant is wet, you can add sprinkles or other decorations, if you desire. Continue the dipping process with remaining hearts and fondant. To color the fondant, add a few drops of food coloring and stir until well-blended. Repeat the process until you have dipped all of your hearts. Allow the fudge hearts to set at room temperature. The time will vary depending on your fondant and how much moisture was added, but a general estimate is 2 to 3 hours. Once set, your fondant hearts can be served at once. To store, place them in an airtight container with waxed paper dividing the layers.